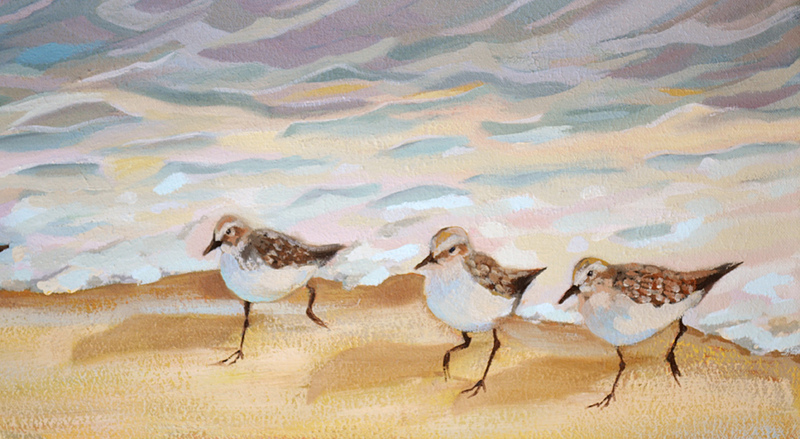 The sandpiper birds oil painting on canvas is coming along well. I have continued working on the background wave that is pushing these little shorebirds to run away from this approaching water. This canvas is 8″ x 24″ so it is a very long horizontal painting. I liked this long horizontal for a row of sandpiper birds scurrying at the waters edge. Here is the first image from the start of this beach painting. This is a closeup of the 3 birds on the right side of the painting. If you look at the oil painting closely you can see all the blues, pinks, violets and yellows that are in this painting. I thought this would be more interesting than having just white, blue and gold colors.